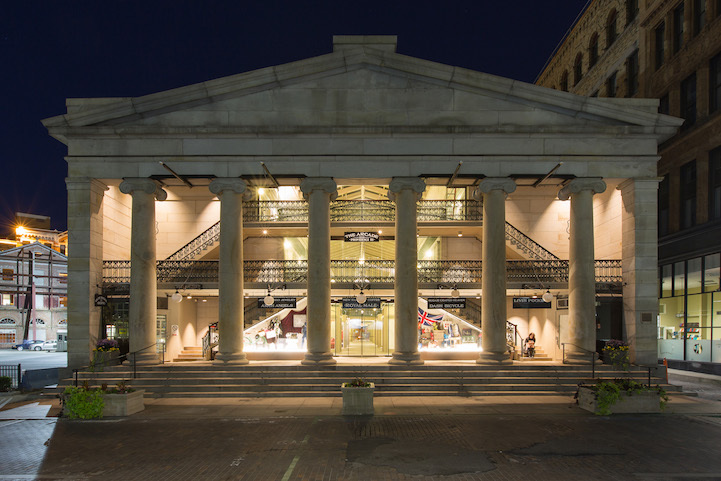 Built in 1828, the first enclosed shopping mall in America now has affordable housing beyond its grand Ionic columns in place of cramped, struggling retail stores, with most of the historic architectural details preserved. 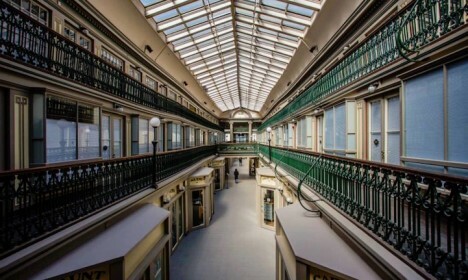 A project of Northeast Collaborative Architects (images by Ben Jacobsen Photography), this project could signal a new phase in adaptive reuse with respect to interior malls both old and new. 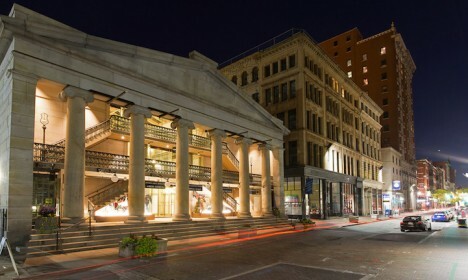 Rhode Island’s Providence Arcade began its long tenure in the capital city’s downtown district as Westminster Arcade, three stories of shops under a glass gable roof with sunlight streaming down to the first level in the airy atrium. But even back then, nobody seemed to want to go beyond the first level, putting the mall at risk of being razed decade after decade. 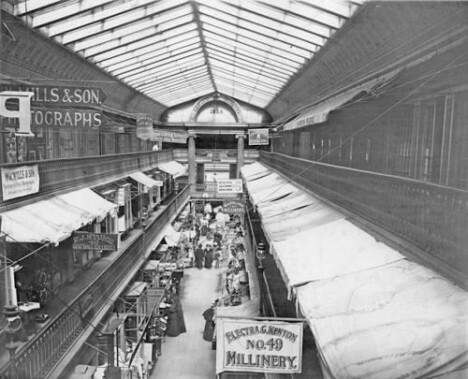 Preservationists intervened to save it in 1944, and it was designated a National Historic Landmark in 1976, which still didn’t do much for business. 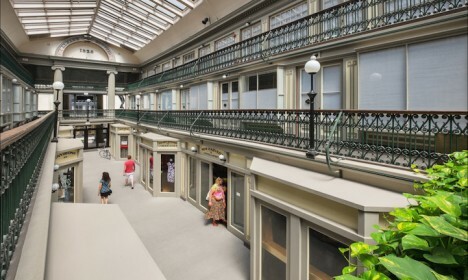 It languished, with most of its retail spaces empty, until its closure in 2008, when its owners realized it had become “economically obsolete.” But as housing costs in the city rose through the proverbial roof, one developer saw the potential for the Arcade to shift its primary purpose. A $7 million renovation completed in October 2013 added 38 standard rental units and eight larger apartments to the second and third floors, keeping the bottom floor for commercial use. 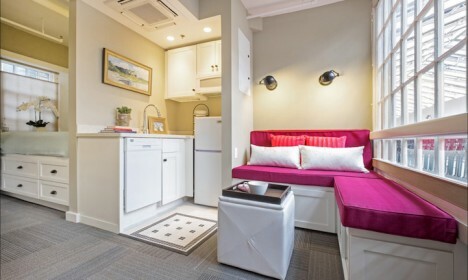 The micro apartments measure from 225 to 300 square feet and include a bedroom, kitchen, bathroom and storage, including built-in bed platforms and wardrobes. 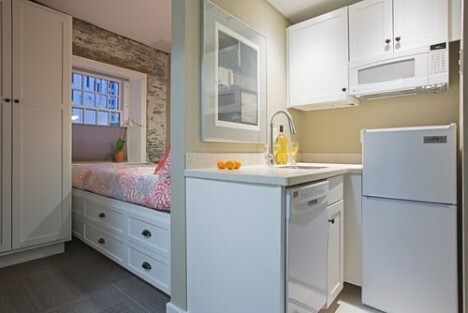 Some even have sleeping spaces for guests in the form of twin Murphy beds. 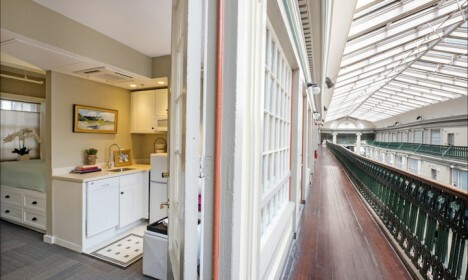 Residents at the complex also have access to a game room, laundry facilities and additional storage space, and in case you’re wondering what it would be like to basically live in a mall, the commercial spaces on the bottom floor are enclosed by bay windows to keep noise to a minimum. 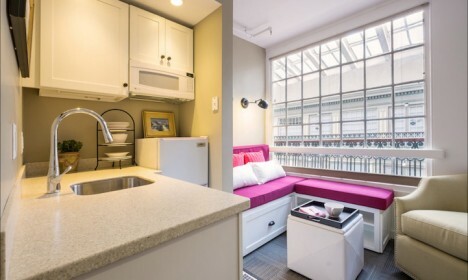 Rent starts at just $550 a month, luring in a waitlist that’s at least 4,000 names deep.